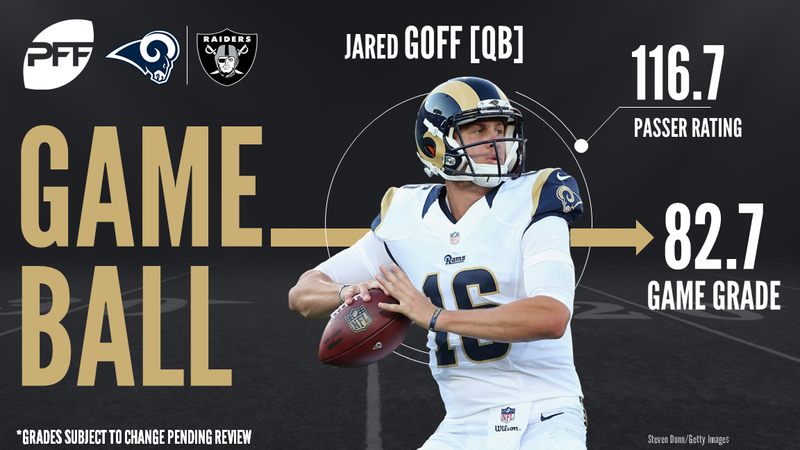 QB Jared Goff was on fire early, shaking off a Khalil Mack sack to hit WR Cooper Kupp with an early touch down and leading another scoring drive that finished with a RB Todd Gurley touchdown. QB Derek Carr and WR Michael Crabtree responded with their own touchdown, but the Raiders fell ot the Rams 24-21. With that we give you our PFF exclusive takeaways from the contest for each team. Every quarterback needs a security blanket, and if today was an indication of what’s to come then Cooper Kupp has earned that role for Goff. Kupp caught six of seven passes for 70 yards and a touchdown on the day, good for an impressive 3.68 yards per route run. Every time the Rams needed a big conversion, Goff looked for Kupp and he delivered. After starting last season on the Rams’ practice squad before being promoted to the 53 man roster in November, Countess was hoping to stick on the Rams roster again and contribute some time on defense. Performances like Saturday night’s one will help that. Countess was targeted four times allowing two receptions for only 12 yards, only two of which came after the catch. Countess also added in two pass breakups and when he was targeted he allowed a passer rating of only 56.3. In the offseason, Johnson was hit with the franchise tag by the Rams for the second straight year. Johnson hopes to put together another good season so he can be rewarded with a long term contact next season. He showed that he is capable of being the Rams’ number one cornerback with his solid play in the second pre-season game. In his 13 snaps in coverage, he was only targeted once. He intercepted that pass by cutting off Michael Crabtree’s route and running it for him for an easy pick. Johnson finished with a coverage grade of 81.7. In his third season as a pro, Cooper hopes to take the leap and become the Raiders’ No. 1 wide receiver. He was outstanding on Saturday night catching three of his four targets for 46 yards. His highlight came on a go route down the right sideline where he out jumped several Rams defenders to high point the ball and bring it down for a 31 yard gain. With Donald Penn still holding out, the Raiders left tackle position is in the air. Marshall Newhouse got the start, but the best tackle on the night for the Raiders was Sharpe. Sharpe, a fourth-round pick out of Florida, did not allow any pressures on his 23 snaps in pass protection. He finished the game with an 81.9 pass protection grade. Mack didn’t take long to remind us why he’s arguably the best edge defender in football, recording a tackle for loss on the very first play of the game. His pass-rushing was as good as ever as he recorded a sack and two additional hurries on just 11 pass-rushes, good for a 22.7 pass rushing productivity mark. His 80.0 pass-rush grade was the highest on the Raiders. If Adams can continue to play like he did tonight, he could find himself playing significant snaps this coming season. Adams was all over the field for the Raiders defense, finishing with four tackles, a solo run stop and two quarterback hurries. But he was even more impressive in coverage. As the primary coverage defender he allowed just one catch for five yards on 17 coverage snaps, good for a very impressive 0.29 yards per coverage snap on the game.